Tomorrow, on the 8th of May 2018, Google will release "dot app" domains to general availability. The term “app” is a modern take on the word software or application designed for mobile devices. Think of all the new possibilities for your business when using “name.app” in your company or projects. According to Google, buying an .app domain has several advantages. First of all, it can be a way of promotion for a service – for example, when you are a developer, a person who enters your site under .app will know that in the Google Play store he could find a special program designed for smartphones and tablets. Mobile applications are currently very popular. Thousands of creators all over the world create different types of applications. There is over one million of applications for various mobile devices. 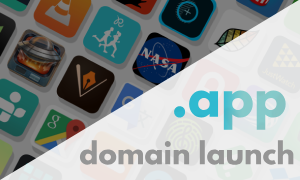 Various companies have already bought over 3,000 new domains under .app – yet before the launch. Contact us now to grab your very own .app domain name!